It includes one transmitter and one receiver, both featuring 3G-SDI and HDMI connections. Both can also be outfitted with high gain antennas for increased range and resiliency. 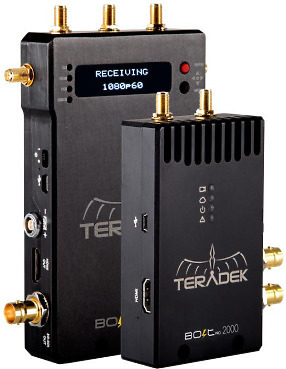 Hire the Teradek Bolt Pro 2000 set RX & TX from Procam. Best service and rental rates for the Teradek Bolt Pro 2000 set RX & TX and all cameras, lenses, sound, lighting and grip.